Prince Charles is the 21st to holder of the title, in a line which began in 1301, when Edward I formally created his son - destined to be Edward II - Prince of Wales. The title is intended for the male heir apparent to the throne, but there is no automatic succession. When The Queen came to the throne in February 1952, there had been no Prince of Wales since the future King Edward VIII, who held the title from 1911 to 1936. The Queen had let it be known in her Coronation Year, when The Prince was four, that she intended to postpone his creation as Prince of Wales until he was of an age to appreciate its importance and significance. In fact, The Prince was not created Prince of Wales until he was nine years old. 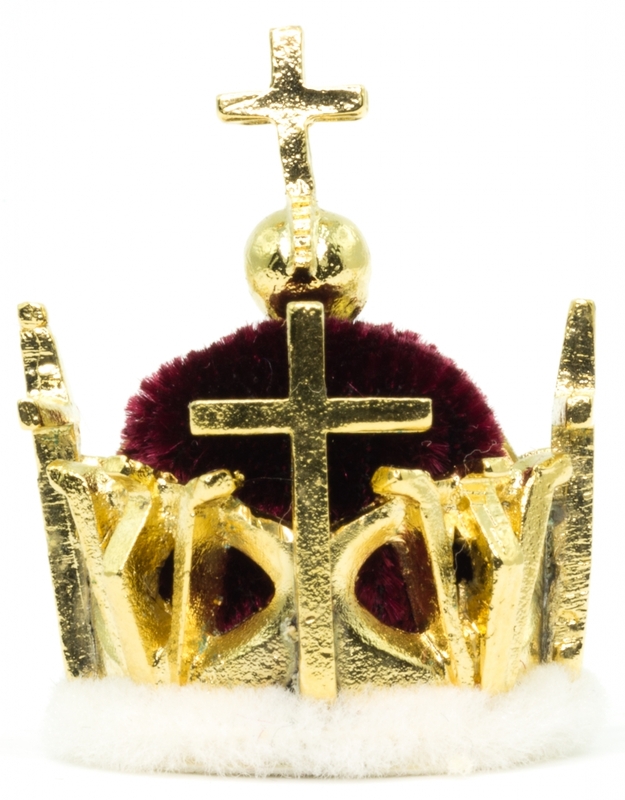 This Crown was a gift in 1969 from the Worshipful Company of Goldsmiths. It was designed and made by Louis Osman, using a new technique of applying gold to a resin base by electrolysis. The main body of the coronet beard four crosses pattee and four fleur de lis made of Welsh gold. Set with seventy five diamonds and twelve emeralds, the single arch of the coronet is surmounted by a symbolically engraved orb featuring a Welsh dragon, the corn stooks of the Earl of Chester, feathers of the Prince of Wales and bezants of the Duke of Cornwall. This product comes with a Gift box and romance story card. The Hohenzollern's are a German family, originating in Württemberg, the main branch of which held the titles of elector of Brandenburg from 1415, king of Prussia from 1701, and German emperor from 1871. In 1911 King George V decided to revive the ancient tradition of investing his son, later to become Edward VIII and Duke of Windsor with the symbols of his office as a state ceremony held at Canarvon castle. William I was the second son of King Frederick William III of Prussia and Louise of Mecklenburg. The original: In 1803 Napoleon conferred the title of ‘Prince Elector’ on the Margrave of Baden, who three years later declared himself to be a sovereign Prince, with the title - Grand Duke. When Napoleon crowned himself Emperor of the French in 1804 he was anxious to associate the new Imperial title with the name of Charlemagne, and a new set of regalia to which the name of Charlemagne was attached was provided. 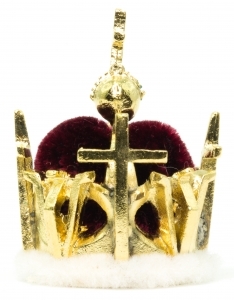 The Crown of Russia was created by the court jeweller J. When the Prince Regent became King in 1820 he immediately started planning his 'intended gorgeous and extravagant coronation', and in particular the design of a new coronation crown. This crown, made with pearls of extraordinary quality, was ordered for the wife of the first king Maximillian I, Caroline Frederika of Baden. On the occasion of the marriage of Crown Prince George to Princess Marie of Saxe-Altenburg in 1843 the King ordered crown jewels to be made which included this crown, made of gold, set with emeralds, sapphires and oriental garnets. The Investure of a new Princes of Wales dates back to Edward I, who according to legend presented his son Edward, to the Welsh People. According to the 1814 Norwegian Constitution, King Carl III John was to be crowned in Nidaros Cathedral. 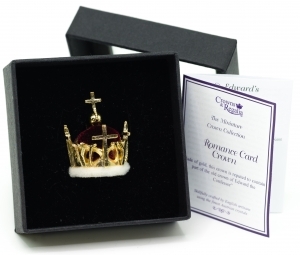 This stunning 5 piece miniature set includes the famous crowns that Queen is associated with. This crown was made for King George V when Prince of Wales, to wear at his fathers coronation in 1901.